As promised, here are yummy foods to cure acne from the inside. Didn't I tell you, curing acne could be fun and indulgent too? 1) Organic Green Tea - Green tea is rich in an anti-inflammatory chemical called catechins, which helps to combat free radicals and prevent fine lines. 2) Olive Oil good mono-unsaturated fats like olive or sesame oil contain essential fatty acids that are needed for good health. Fats are an integral part of cell membranes and will help to nourish the skin and give it an inner glow. 3) Walnuts - They are rich in omega-3 oils, another powerful antioxidant that helps to keep the skin plump and flexible. Omega-3 oils are also found in oily fish such as salmon, or in flaxseed oil. 4) Berries Blueberries, raspberries, cranberries are all rich in phytochemicals that are protective of skin cells. You can't get the same results though, from frozen or preserved fruit. 5) Lemon Juice - It's a natural bleach and can be used to fade sunspots and freckles. Put a slice of lemon over the spot and leave it for 10 minutes everyday for a week, or exfoliate by rubbing a cut lemon and half a teaspoon of granulated sugar over the skin for a few minutes. Be careful not to get any lemon in your eyes and stop immediately if you get a bad reaction as some people have extremely sensitive skin. 6) Watermelon Some people believe that rubbing their faces with the rind of a watermelon will give them beautiful skin.There is plenty of truth to this, as the pulp of the fruit is a good exfoliant and watermelon is rich in vitamins A, B and C. The fruit contains a lot of water which serves to hydrate the skin and the gentle massaging action will stimulate lymphatic drainage. 7) Low-Fat Dairy Products - One the most important components of skin health is vitamin A. One of the best places to get it is low-fat dairy products. In fact, experts say that the health of our skin cells is dependent on dietary vitamin A. 8) Whole-Wheat Bread, Eggs and Brazil Nuts - Dietary Selenium comes from nuts, cereals, meat, fish, and eggs. Brazil nuts are the richest ordinary dietary source. 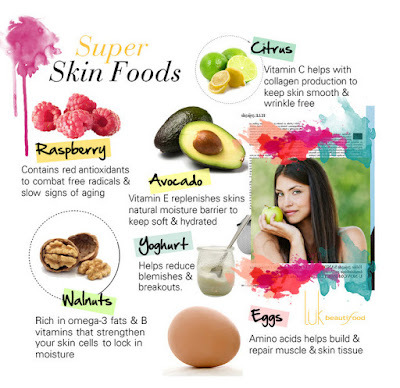 The mineral selenium connects all these foods for healthy skin. Experts say selenium plays a key role in the health of skin cells. Some studies show that even skin damaged by the sun may suffer fewer consequences if selenium levels are high. 9) Yogurt - Yogurt is a very important natural beauty aid. Apply yogurt on the face every morning as a quick nourishing facial mask. Wash it off after a few minutes with cold water. This will keep the complexion smooth, healthy and fresh. A mixture of yogurt and lemon juice is ideal for softening hands.